Fans of the game struggled to log on during the Pokemon GO gathering - the game's servers have repeatedly struggled due to overwhelming demand and repeated Denial of Service attacks by hacker group PoodleCorp over the weekend, July 20, 2016. Eyeing the excitable mob, one of whom was giving out instructions through a loudspeaker, the grim-faced Internal Security Forces (ISF) official looked wary as he tried to figure out what was going on. Although the energy and placards evoked the "You Stink" protests that rocked Lebanon last year, he needn’t have worried, this time revolution was not in the air. His bemusement was understandable. An augmented reality game involving players hunting virtual monsters in the real world using their phones, Pokémon GO has become a global hit in the space of a few weeks. A Lebanese Pokemon GO gathering moves on to Zaitunay Bay, Beirut's exclusive seafront neighbourhood. In Lebanon, it is no different, and a few days ago, hordes gathered in Beirut for the country’s first official Pokémon GO get-together despite the fact the game is not officially out yet in the Middle East. While many are desperate to live up to the game’s slogan "Gotta catch ‘em all," in a country where security is tight and fear of violent spillover from the Syrian war remains, one poorly thrown Pokéball can get you more than you bargain for. Pokémon hunters across Lebanon are having mixed fortunes. In the northern region of Akkar, seen as largely neglected by the state, one user complained of a “wasteland’ devoid of PokéGyms or PokéStops, while according to some rumors, those living in the prestigious Verdun neighborhood of west Beirut have access to a veritable Pokémon Goldmine. One thing is proving consistent. Camera-shy at the best of times, security forces, police and army in Lebanon are occasionally finding themselves in the crosshairs of a few unwitting Pokémon hunters, whether they are at checkpoints, army bases or other locations deemed sensitive. It was the early hours of the morning in Lebanon’s southern city of Saida when 21-year-old Rassin Tamim decided to pull out her phone and see what Pokémon were lurking nearby. 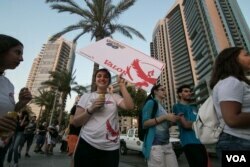 At the Pokémon GO gathering, which involved a large group going on a poke-hunt from the city’s upmarket souks and bearing placards stating allegiance to Pokémon teams, others learned from the mistakes of friends. Muhammed Zeitoun, 16, restrained himself from getting out his phone to capture Eevie, a deer-like Pokémon, in front of a ministry building for fear of attracting unwanted attention. Pokémon GO is not yet officially available in Lebanon. But that hasn’t stopped fans from downloading the popular game. While the game has attracted legions of fans young and old, some governments and officials in the region have reacted with suspicion, if not downright hostility. Kuwait’s Interior Ministry has reportedly put out a warning against gamers pointing camera phones at mosques, military buildings or the Emir’s palace. In Egypt, some clerics oppose the game — perhaps not surprisingly, considering in 2001 Egypt’s then-Grand Mufti issued a fatwa against the Pokémon franchise. So far, it seems like the Lebanese government has refrained from rushing to judgement, and a soft-touch approach appears to have largely prevailed, with offending phones checked and their owners told to be on their way. 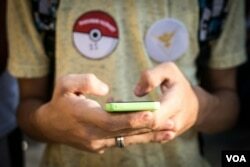 As one source at the ISF put it, “The game is new in Lebanon, so we’re waiting to see what we will do.” That was before he noted with a chuckle that he’s read about one Pokémon GO enthusiasts getting briefly arrested for pointing their phone at the headquarters of another important government security institution. Then again, some in positions of authority are more sympathetic than others. 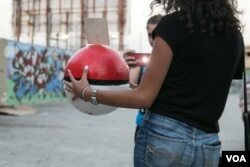 A Pokemon GO fan poses with a replica Pokeball during a gathering organised and backed by a Lebanese tech firm, which hid energy drinks in the Pokeballs. Watching over the gathering was a 24-year-old policeman, Muhammad, who said he was “addicted” to the game, and even confessed to logging on during patrols. “I play it, so I can tell when people are paying Pokémon,” he said when asked about those in the midst of Pokemania being mistaken as a threat to national security. “Others in the police don’t know about it, they’ll think they’re taking pictures,” he said, adding that he expected colleagues to be briefed on the issue as Pokémon GO’s popularity grows. In a country without a president for well over a year, the game has provided some with a handy way of satirizing the very same authority figures hidden in Lebanon’s government buildings and away from camera phones. Activist Assaad Thebian, prominent during the You Stink protests sparked by Lebanon’s trash crisis, poked fun at the country’s Prime Minister Tammam Salam for the deadlock. “#PokémonGO in @SalamTammam house ... Power & Efficiency is considered to be one of the lowest,” he tweeted. Back at the gathering in downtown Beirut, the world of politics and conflict that all too often characterizes the country’s precarious position seems a million kilometers away, and for some that’s part of the point. Despite the odd brush-in with a security guard, for Zeitoun, the game has been an overwhelmingly positive experience, getting him out of the house and helping him meet people he would otherwise have never met.